It is our view that it is not in the national interest for NOPSEMA to assess this drilling application without concomitant consideration of the impacts of full production in the Great Australian Bight (GAB). Dangers of a significant oil spill are present even with the first drilling and subsequently from further drillings, production and transport. DEA is one of many health and medical organisations calling for urgent action to mitigate climate change. In Australia, these include the Royal Australasian College of Physicians (RACP), The Royal Australian College of General Practitioners (RACGP) and the Australian Medical Association (AMA). Internationally, they include the American Medical Association, the World Health Organization (WHO) and the pre-eminent medical journal, The Lancet. Collectively these groups have highlighted the devastating impact a warming climate will have on human health. Australia plans to become one of the World’s largest producers of natural gas The paper reviews all referenced literature on the mining of gas, potential local harms on the environment and community health from gas mining and its many complex process. It identifies evidence of some health harms which are already occurring in residents close to mines and in particular in the newborn. Of even greater concern is the greenhouse emission profile of gas production which on recent evidence is probably only marginally less than coal, thus negating its use as a transition to renewable energy. DEA recommends that the New South Wales Government Independent Planning Commission oppose the United Wambo Open Cut Coal Mine project on the grounds of negative health effects of climate change, air pollution, social impacts, water quality and environmental risk as well as the economic damage to the infrastructure of Australia and not least to the lives of individual Australians. DEA is pleased to comment as a ‘relevant health organisation’ on the operation of the South Australian Public Health Act 2011. DEA notes that the review is intended to consider if, in the first 5 years since commencement of the Act, the objects have been achieved, including if the powers, structures and tools established under the Act have been effective in providing the framework to achieve the objectives in promoting, preserving and protecting the public health of South Australians. The Queensland government is considering a new bill - the Mineral Resources (Galilee Basin) Amendment Bill 2018 - that would effectively stop all coal mining in the Galilee Basin. DEA has provided a submission to the parliamentary committee outlining the compelling reasons the Mineral Bill should be approved. The risks to water security, ecosystems and air pollution are cause enough, but the overarching concern are the enormous health, economic, security and environmental costs of an inadequate response to global warming. The report’s due date is 30th April 2019. Forests and native vegetation like grasslands, wetlands and woodlands are vital to our wellbeing yet in Australia we are currently seeing an explosion in land clearing. This has wide ranging and harmful implications for human health. Forests and native vegetation like grasslands, wetlands and woodlands support our health and the environment in which we live. From purifying our air and water to providing food, medicines and places of psychological restoration. Continued expansion of natural gas development in Australia carries serious risks for human health and wellbeing both locally and globally. These concerns are detailed in a our Policy Paper on this issue. Further expansion of coal mining is incompatible with action to mitigate climate change . The Australian Government’s consideration of coal-mining in the Galilee Basin highlights the serious disconnect between genuine government commitment to emissions reduction policies, both domestically and as a signatory to the Paris agreement and the approval of new coal mining projects. DEA’s overarching concern is clear evidence of the substantial and rising greenhouse gas footprint of Australia’s expanding gas and oil industry that threatens efforts to urgently reduce emissions and mitigate global warming. Currently Australia is the second largest LNP exporter in the world and expected to be the largest exporter by 2019. Containment of gas development is vital if national and international greenhouse emissions are to be reduced quickly to address accelerating climate change. It is inappropriate to use subsidies for a pipeline which would enable gas production to be increased. Derogation is effectively a subsidy for the pipeline paid for by consumers. Onshore gas development has an increasing number of concerning medical impacts which will need costly health and environmental monitoring and will further detract from the economic viability of the project at a time when renewable energy development is cheaper and non harmful. Along with Mt Piper Power Station License Review, submissions were also submitted for the Eraring Power Station and the Vales Point Power Station in New South Wales. Dr Kathleen Wild represented DEA at the recent Independent Planning Commission meeting in Mudgee regarding the Bylong Coalmine proposal. It was the last opportunity for the community to try and stop the “green fields” proposal. There were over 60 presentations flanked by a heavy police presence. Kathleen did an excellent job outlining the importance of keeping coal in the ground to reduce carbon emissions. Proceedings of the 2018 AGM. DEA in South Australia has contributed to the South Australian Public Health Plan 2019-2024, building on our previous Submissions on the 2013 Plan and during Consultation on the new Plan. DEA affirms much of what is included in the draft State Public Health Plan but have advocated for climate change being an urgent and cross-cutting issue rather than one among a number of other priorities. We have also indicated that the links between human health and the environment must be strengthened, and that the development of a sustainable and climate-resilient health system provides a key opportunity for progress. DEA has indicated that resources for implementation governance are essential and that we are willing to continue to work with SA Health on this important State Public Health Plan. Doctors for the Environment Australia is pleased to comment on this Enquiry for the extinction crisis reflects the rapid decline in biodiversity and ecological services, nationally and internationally, with grave implications for many aspects of human health and survival. There are currently nearly 500 threatened faunal species and our current environment laws, especially the Environment Protection and Biodiversity Conservation Act 1999 (the EPBC), are woefully inadequate. A lack of biodiversity in faunal species impacts human health by threatening our food and water sources, current and potential medicines and crucial cultural and psychological wellsprings. Download DEA's submission to the Senate Standing Committees on Environment and Communications - Australia’s faunal extinction crisis. On 15-16th August 2018 DEA members from NSW (Dr John Van Der Kallen and Dr Helen Redmond) and Qld (Dr Geralyn McCarron and Professor Melissa Haswell) travelled to the north-west inland town of Narrabri to attend and speak at a Coal Seam Gas and Public Health Conference organised and chaired by North West Protection Advocacy. Narrabri Shire is the site of the Narrabri Gas Project of Santos, an 850 well coal seam gas field in the final stages of approval. Helen, Geralyn and Melissa all spoke at the conference, together with Shay Dougall and Dr Methuen Morgan. The audience included local townsfolk, farmers from surrounding regions and members of the Kamilaroi people. The fundamental rationale of the EIS process is to assess the balance of positive and negative impacts upon which informed decisions can be made. The impacts may be environmental, health, social and economic. Whilst DEA addresses public health issues pertaining particularly to environmental causes of ill health, it is clear that good health exists within the wider context of sustainability and preservation of ecological support systems. On this basis we make this submission. Environmental Sustainability & Healthcare: What do Health Professionals Need to Know? Every doctor needs to view this superb presentation by Katherine Barraclough at ANZ Association for Health Professional Educators. It details why environmental sustainability is core business for health professionals and an essential part of health education. Former Premier of NSW Bob Carr is dismayed by Berejiklian's environmental vandalism. In this submission DEA details just one aspect of this destruction - forest clearance. See below for the DEA submission to the NSW government on this issue and note the previous two recent articles from John van der Kallen on this topic. DEA’s submission to the detailed design consultation paper emphasises that, once again, the Energy Security Board (ESB) has completely failed to consider any of the health problems and health costs associated with pollution, climate change and rising electricity prices. The ESB and the federal government totally ignore the other 2/3 of emissions production from transport, industry and manufacturing and agriculture. They have no policies in these areas. This means that Australia will fail to meet its Paris Agreement Targets. Australia will fail its global commitment to emissions reduction. These failures guarantee deaths and illness for the people of Australia. The Federal Government’s proposed National Energy Guarantee (NEG) is being presented as a bipartisan solution to electrical energy supply. However, DEA agrees with energy experts that this proposal only entrenches the dominance of coal-fired power in the eastern states and locks-out the emergence of more renewable energy. With the NEG, ambitious emissions reduction would be overlooked in the interests of false claims that a dominance of coal-fired power is the only way to ensure energy security and reliability. Despite ongoing public pressure, missed deadlines and lack of secure funding, Adani is pushing ahead with their plans to build Australia's largest coal mine in the Galilee Basin. Their latest bid is to extract yet more water - from the Suttor River via the North Galilee Water Scheme - without a full environmental assessment. This water would potentially be used for other coal mines in the area, and the Suttor River feeds into the major river system going to the Great Barrier Reef. DEA put in a submission to Adani's North Galilee Water Scheme Project to have this project fully scrutinised both for its health and environmental impacts. The Victorian Government continues to involve the community in developing strategies to improve air quality in Victoria. DEA points out that Victoria needs to take stronger measures to reduce pollutants particularly from the coal-fired power stations in the Latrobe Valley. DEA made a submission in 2017 opposing this new coal mine. Our criticisms were opposed in a supplementary EIS. We have responded to this repeating that this is a dangerous mine to travellers on the Bruce Highway, because of blast plumes from explosions. The mine workings drain into an estuary and therefore is harmful to the Reef. The groundwater of this agricultural area is also under threat. The Queensland government continues to present huge problems for the climate and the Reef. South Australia's second state public health plan is currently under development. The DEA(SA) committee recently prepared a submission commenting on the draft summary framework for the new plan, highlighting opportunities for increased consideration of environmental health issues and the need for a 'climate and health in all policies' approach. DEA(SA) has offered to provide ongoing input during the development of the new plan, with a draft expected in August 2018. Download DEA's submission to the summary framework for consultation: SA DRAFT State Public Health Plan 2019-2024. DEA has made a submission to this review. The government notice says “Independent Reviewer, Dr Wendy Craik, is undertaking a short-term targeted review to reduce red-tape and find practical ways to help farmers meet the requirements of the Environment Protection and Biodiversity Conservation Act 1999 (the EPBC Act). The review will help unpack the issues faced by farmers to find real solutions while maintaining the high environmental standards Australia is renowned for." The use of the words “red tape” is likely to indicate the real intent but DEA has risen above these political aims. DEA strongly supports the Gregadoo Solar farm project. The reduction of Carbon intensive energy generation is an essential component of limiting our greenhouse gas emissions, which are contributing to global warming with devastating effect on the health of the planet and its inhabitants. Pollution from Carbon energy also contributes significantly to ill health. DEA is concerned by the outlook for human and planetary health of inadequate control of global warming and climate change. In a submission to the Victorian government on emissions reduction targets, DEA supports the leadership and actions undertaken by Victoria in the absence of genuine action by the Federal Government to meet Australia’s commitments to the Paris Agreement 2015. Download DEA's submission to the Independent Expert Panel on the Interim Emissions Reduction Targets for Victoria (2021 – 2030). Watch this video from our recent conference - iDEA18 in Newcastle. Watch Dr Bob Brown deliver the keynote address at our recent conference - iDEA18 in Newcastle. Unhealthy environments, climate change, and poor diet are major contributors to both chronic and acute illnesses. Changes to the way we produce our food, and the type of food we eat, are urgently required for both human and planetary health. The United Nations sets these goals not just for developing countries but for all countries including Australia. Although Australia has one of the highest life expectancies in the world, our SDG targets, particularly on health and the environment, have slipped 6 places in the last reporting year to 26th place globally. Furthermore, our overseas development aid to help others attain their goals is inadequate. DEA has made a submission to Parliament on SDGs. A recent statement by the McGowan Labor Government who plan to make WA into a "global LNG hub" is deeply concerning for the control of green house emissions. Furthermore it begs the question whether the recent WA enquiry into the risks from fracking might be used to promote the production of additional (unconventional) gas in the state. Download the DEA Inquiry into Hydraulic Fracture Stimulation in Western Australia 2017 Submission and media release. The Federal Government has produced a biodiversity conservation strategy paper which is deeply flawed in its assessments and fails to understand the urgency for action. In response, DEA has written a submission which demands action. The government has no recognition of climate change as a causative factor in biodiversity loss or of the health effects this will have. Download DEA's submission on Australia’s Strategy for Nature 2018-2030: Australia’s biodiversity conservation strategy and action inventory. The consultation paper is fundamentally flawed in failing to include health considerations from air pollution and greenhouse gas emissions which have considerable costs to human health and the nation. Australia’s fuel standards for vehicles are the lowest of the countries comprising the OECD and amongst the lowest in the G20. They cause ill health and deaths from air pollution and also contribute a large and growing proportion of our greenhouse emissions. There has to be reform. Read DEA's recommendations to the Ministerial Forum on Vehicle Emissions on the Better fuel for cleaner air draft regulation impact statement. To address the health impacts of climate change - the greatest global health threat of the 21st century - national leadership and reform of governance are urgently needed. In this submission DEA analyses the current SA public health plan in the light of our submission; South Australia: A Better Place to Live 2013. We conclude it is necessary to show more urgency in climate change mitigation, to bring climate change into all policies and to work for national coordination through the development of a National Environmental Protection Agency. Dr Geralyn McCarron, a Brisbane GP, has spent more than five years living in the gas fields of Australia. This experience has led Dr McCarron to provide testimony both nationally and internationally regarding the health impacts of the gas industry and most recently authoring and publishing a peer reviewed paper. Doctors for the Environment Australia make the following submission with eight recommendations in relation to the licence reviews of Victoria’s power stations as brown coal-fired power stations are major polluters and greenhouse gas emitters. Doctors for the Environment Australia welcomes the opportunity to provide further feedback following the release of the draft Final Report into Hydraulic Fracturing. It is our recommendation that the moratorium on fracking in NT should be extended indefinitely. Whilst the Inquiry has identified regulatory options that may minimise some of the risks of fracking, DEA believes that for NT, such a response is premature, overly optimistic, and overlooks climate change which is the greatest threat to human and economic health that we face. Download the Submission to the Scientific Inquiry into Hydraulic Fracturing in the Northern Territory in Response to the Draft Final Report. Bushfires have always been a part of the Australian ecology, but now that ecology is changing. The impacts of a development must be seen in the context of national and international health. These important links are explained in “The health factor: Ignored by industry and overlooked by government”, Appendix 1: The need to protect public health. DEA supports the prohibition of open cut mining in the mapped area of the Upper Hunter near Jerrys Plains. However DEA is of the view that the amendment does not go far enough, and that all coal mining on the site should be prohibited. This is because any form of coal mining on this site would have damaging effects on local population health, the environment and existing industry. Furthermore, coal mining on this site would have negative global effects, from the contribution to greenhouse gas emissions and the subsequent effects of climate change, including threats to health. 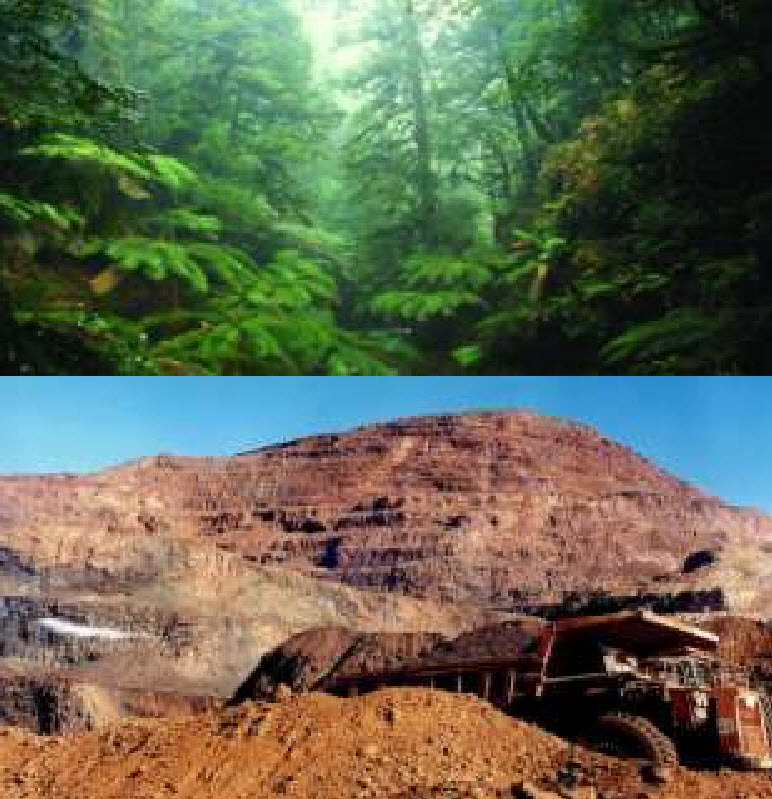 Therefore DEA advocates for the Mining SEPP amendment to be widened, to include a ban on all coal mining on the site. In making this submission we consider both projects together as they share commonalities of concern to us.At this time, when global warming is shaping an energy transformation around the world, South Australia is recognised as a leader in renewable energy. To turn to fossil fuel power generation in order to fill a shortfall in capacity is regressive and cannot be justified on health grounds (or economic grounds, given the price of gas). 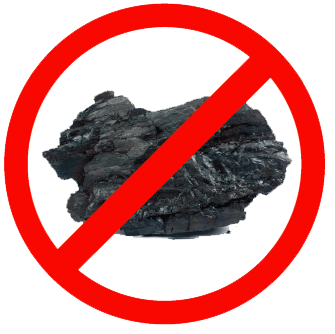 Since the initial DEA submission there has been new evidence regarding the impact of open cut coal mines on health as well the rejection of a similar proposal, the New Acland Coal mine extension, by the Land Court in Queensland. DEA rejects this proposal on health grounds. The mine is simply too close to the township of Gloucester, risking the health of the local population and nearby populations from pollution along the coal corridor. DEA has already made a comprehensive submission and provided additional information in a further submission to the Inquiry, and these are now in the Submission library (numbers 96 and 477). Transport is an important part of a developed nation such as Australia, providing goods and services vital to health and the economy. The way in which transport is conducted in Australia is important to the health and well-being of all Australians. Organised by members of Doctors for the Environment Australia, this public forum held at James Cook University in Townsville involved doctors, nurses and farmers speaking out on the impacts of the Adani Carmichael mine on health. The rapid expansion of the coal and unconventional gas industries has not only created widespread community concern over health and environmental issues but it has exposed the inadequate processes whereby the New South Wales (NSW) government is acting as proponent in their perceived interest of economic development whereas they should be acting as arbiter. ….It is also increasingly apparent that, even with a 2°C rise, the world will be greatly changed from present, with economic budgets greatly stressed by reparation of infrastructure and all the pillars of life, water, food, air quality and biodiversity-resilience under stress and facing likely deterioration….. It is also very important that the NAIF also takes into account our responsibilities to various international agreements such as the Paris Agreement. This would seem consistent with the paragraph in the White Paper – “The north will be an exemplar of sustainable development. The development of major population centres of more than a million people will underwrite substantial exports of planning, design, architecture and construction to the Tropics”. Each step of the coal to energy generation lifecycle – mining, transportation, washing, combustion, and disposing of waste – impacts upon human health (Epstein, 2011). Globally air pollution is an increasingly important public health problem. Nationally ambient (outdoor) air pollution contributes significantly to morbidity and mortality. Reductions in fossil fuel combustion to mitigate climate change have the potential to also benefit health by reducing concentrations of air pollutants which contribute to respiratory and cardiovascular disease and premature mortality. DEA notes a number of deficiencies, unsupported assumptions, known and unknown risks in relation to the Santos Narrabri Gasfield project. We recommend rejection of this proposal on the basis that it cannot sufficiently guarantee the safety of human health and ecosystems supporting health. Coal is hazardous to health. It pollutes our land, water and air, and contributes to further climate change – the biggest threat to health this century. Doctors for the Environment Australia (DEA) is concerned about the health effects of climate change on humans and the biosphere on which humans depend. DEA is also cognisant of policies that can address both existing health problems and reduce the impact of climate change. It is in this holistic risk–co-benefit framework that DEA examines the climate change policies of Australian federal and state governments. DEA notes that the Climate Change Authority (CCA) will join with the Australian Energy Market Commission (AEMC) to review an Independent Review into the Future Security of the NEM. The report of this Independent Review is not yet available, so why there has to be further review of an unpublished Review is problematic and raises questions of probity. DEA commends The Climate Change Authority for taking a lead in exploring the ways in which Australia’s agricultural sector can move from being a major contributor to climate change and degradation of natural resources to being part of the solution, whilst maintaining or improving productivity. Australia has seen rapid growth in interest and development of exploration and drilling for unconventional gas reserves from coal seams, shale deposits and tight sands. These reserves require special techniques such as fracking, in-seam and horizontal drilling. Doctors for the Environment Australia is concerned that the rush to exploit this resource has outpaced regulation to protect public health and the environment, and to adequately assess the health impacts, including exposures to industrial chemicals. Mining incurs a range of environmental impacts that persist after the production phase of the mine has ended. There are changes in vegetation and landscape, exposure and potential ignition of fossil fuels, the pollution of air, soils and water, the introduction of aquatic sediments into water sources and land subsidence. Any of these can result in loss of productive land, loss or degradation of groundwater, pollution of surface water and air pollution from dust or toxic gases, with subsequent negative impacts on human health. Energy reliability and security, and affordability which are all essential for the cohesion and health of our society can be achieved by the continued inclusion of renewable energy into the market; small- and large-scale wind and solar, supported by smart switching and controlling technologies; and by energy storage facilities such as batteries, pumped hydro and concentrated solar thermal. DEA welcomes the opportunity to respond to the discussion paper ‘Better Fuel for Cleaner Air’ and notes that the scope of the paper is limited to consideration of fuel quality standards while vehicle emission standards and fuel efficiency (greenhouse gas emissions per kilometre) are to be considered separately by the Department of Infrastructure and Regional Development. Australia has abundant reserves of coal, which is mined to power the majority of our electricity generation and exported overseas for coking and power generation. Due to the apparent low cost of this abundant resource Australians are enthusiastically exploiting it as rapidly as possible. DEA is keen for the electorate to take climate change seriously. It is imperative that the voters consider climate change as a priority when voting. As a result we have created two posters that can be distributed widely. To address the health impacts of climate change – the greatest global health threat of the 21st century – national leadership and governance are needed. Australia is poorly prepared for adequate adaptation to the health impacts of climate change and thus the community’s health and our health services are vulnerable. On reviewing the Interim report one is encouraged by the availability of natural energy resources in Tasmania. 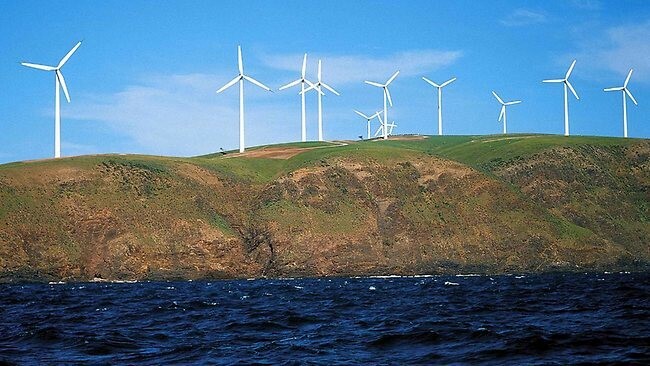 Unlike most other states Tasmania has three quarters of stationary energy available through hydro and it has unlimited wind, solar and other modalities which with storage would make the state self-sufficient in clean energy and attain zero emissions from its energy sector……. We agree with the proposition that although NSW has relatively clean air by global standards, there is still a burden of disease attributable to air pollution and considerable health benefits available by improving air quality. Coal-fired power stations (CFPS) are substantial sources of air pollutants. Temperatures are expected to continue to increase in the 21st century due to climate change. The CSIRO & BOM predict that by 2070, temperatures in Australia will rise by up to 5°C with longer, hotter, more frequent heatwaves expected. An urgent need to address carbon emissions and a move towards renewable energy are creating structural changes in energy supplies that are having, and will have, profound impacts on workers and communities in the energy sector. With knowledge and planning, those impacts can be attenuated, but without such planning, community and social effects can be long lasting……. This is the main DEA information handout in the form of a tri-fold sheet leaflet. Victoria’s coal fired power stations are responsible for almost 50% of the state’s climate pollution. It is impossible to make a difference to Victoria’s carbon pollution without addressing the operation of these power stations. Any energy derived from brown coal is ‘part of the problem’, as its GEI is above that achievable from other sources of electricity generation………. To avoid a rise of greater than 2°C, 80% of known coal reserves must stay in the ground . We acknowledge the Northern Territory Government for its implementation of a moratorium on hydraulic fracturing (fracking), and the establishment of this inquiry and public consultation. DEA is concerned with the projected devastating effects of climate change on human health (and by extension, all forms of life in the biosphere). We note that the Paris Agreement does not deal with health adequately. The Treaty does acknowledge, rather inconspicuously……. The Terms of Reference of this Inquiry do not address the issues raised by DEA in our submission around the link between the pipeline project and the onshore gas development required to make the project viable. As part of the Victorian Government’s plans to move away from coal-fired power stations, the government established an independent review of coal policy. This review, together with the review of the Climate Change Act, the Renewable Energy Roadmap, and the Hazelwood Mine Fire Inquiry, will feed into a new coal policy which will take into account environmental, social and economic factors. Since about one-third of all Victoria’s emissions are from coal, and since the Victorian government had already committed to net zero emissions by 2050, DEA believes ambitious reduction in coal use is required. Doctors for the Environment Australia recommends that the present budget for ARENA be maintained as a preventative health measure. Doctors for the Environment Australia has made many formal submissions from our medical and scientific experts and have had the opportunity to observe the processes and performance of successive Queensland governments. On this occasion we will make some general observations and comments in relation to the report “Advancing Climate Action in Queensland. Making the transition to a low carbon future”. Building on experiences between farmers and gas drilling operators in other states, in the absence of baseline studies, contamination and pollution by exploration and mining activities cannot be proved and so cannot be attributed to such activities. For example the Condamine River in Queensland……. 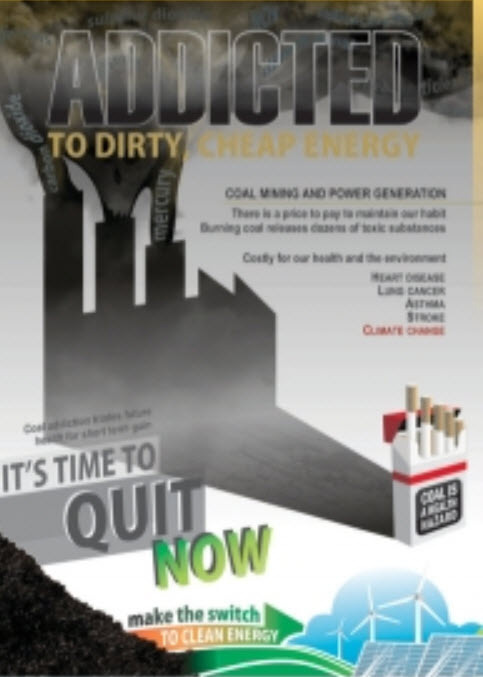 DEA strongly advocates, for the health of the community, the phasing out of coal fired power stations. As medical doctors we welcome this opportunity to contribute to the community discussion about opportunities to improve the oversight and management of the Yarra River. We rely on natural ecosystems for clean air and water; healthy fertile soils in which to grow our food; a stable climate in which to thrive and a rich tapestry of living organisms- biodiversity- from which we have taken food and developed over half of the medicines in use today. Unconventional gas is ‘natural gas’ that is trapped in rock from which it is difficult to extract, requiring specialised mining procedures and often access to large areas of land. Unconventional gas development (UGD) is the extraction of natural gas which is difficult to access conventionally, from coal seams, shale or other rock formations, using techniques such as directional drilling and hydraulic fracturing (fracking). Hydraulic fracturing involves the pressurised injection of fluids, sand and chemical additives into rock to open up fractures, allowing gas to flow out. Our health is absolutely dependent on our natural environment. We rely on natural ecosystems for clean air and water, healthy, fertile soils in which to grow our food, a stable climate in which to thrive and a rich tapestry of living organisms- biodiversity- from which we have taken food and over half of the medicines in use today. Currently we are facing urgent threats to our wellbeing from climate change and biodiversity loss. As medical doctors we welcome this opportunity to provide input to the Victorian government’s review of biodiversity protection – a plan that is desperately needed to address the appalling rate of species extinction in our state. Vehicle emissions are a major public health issue with approximately 3,000 deaths per annum in Australia resulting from air pollution; a figure greater than total road accident deaths. A significant proportion of these deaths and the chronic illness of thousands more is caused by vehicular pollution. 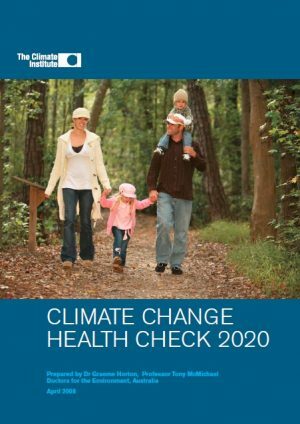 Doctors for the Environment Australia has developed this fact sheet to outline the effects of climate change on human health particularly in Australia, and how health can benefit from efforts to lessen and prevent climate change. The recent Paris Agreement under the United Nations Framework Convention on Climate Change (UNFCCC) has once more highlighted the urgent need for action to limit global warming. Tasmania and Australia more broadly, is already experiencing the human health impacts of longer, hotter and more frequent heatwaves , with recent heatwaves around Australia producing increased hospital admissions and deaths, and putting extra strain on healthcare and emergency services. Recent years have also seen increasingly frequent and severe bushfires in Tasmania. Bushfires pose numerous risks to health including direct injuries, burns and deaths from the fires themselves, as well as through cardiorespiratory effects of smoke on people living hundreds or even thousands of kilometres away…. DEA is of the view that a national approach is essential to reduce the extensive risks associated with unconventional gas mining. It is a great disappointment that numerous Climate Change Authority discussions and documents on the issue of climate change have failed to emphasise its impact on health. To avoid widespread, severe and irreversible impacts associated with present trajectory of 4 degrees of global warming, urgent action must be taken to reduce greenhouse gas emissions. The response of Government thus far has been grossly inadequate – and that Australia needs to commit to a reduction target on 2020 levels of at least 40% by 2025 and a reduction of at least 95% by 2050. This is the only way that we might be able to confine global temperature rise to 2°C and thus avoid severe consequences to human health. The time to act is now. The Global Burden of Disease report from WHO estimates that ambient air pollution is responsible for 3.7 million deaths worldwide (2012 estimate). Doctors for the Environment Australia (DEA) opposes the approval of the Rix’s Creek continuation on the grounds that the area, and in particular the inhabitants of Camberwell and Singleton already suffer high levels of particulate air pollution and the extension of mining will exacerbate the probability of respiratory harm in a region with many existing coal mines and poor air quality. New research on the health effects of air pollution has been published which indicates the annual standard adopted by the NSW EPA is inadequate. In the first of a two-part video, Dr Helen Redmond, Rehabilitation Physician, introduces Doctors for the Environment Australia- who we are, what we do and why we do it. We support the approval of the Biala Wind Farm Project, for reasons set out in the DEA policy position on the health effects of wind farms. The EIS states that electricity production from the Biala wind project would displace electricity that would otherwise emit 200,000 tonnes of CO2 per year…. Climate change is a priority issue for DEA. As the 1st Lancet Commission on Climate Change and Health stated in 2009, “climate change is the greatest threat to human health of the 21st century”. The consultation papers for “Developing a New Climate Change Strategy for SA” make very little reference to health. DEA believes health is central to any strategy around climate change as affirmed by the Lancet publications cited above. Our foremost recommendation is to prepare this consultative document urgently. DEA asks governments to consider the public health impacts and health costs to present and future generations of their policies. This is particularly relevant to the Northern Territory (NT) as we make key decisions and create policy settings that will determine our energy supply and economic directions. We recommend that The Environmental Protection Authority conduct a full Health Impact Assessment in accord with existing agreements. According to the World Health Organization (WHO), climate change from global warming is one of the greatest threats to public health and it will affect, in profoundly adverse ways, some of the most fundamental pre-requisites for good health: clean air and water, sufficient food, adequate shelter and freedom from disease……..
DEA has an extensive history of advocating for the protection of health in relation to the coal industry nationally and in Victoria. Specifically relevant to the residents of Morwell and surrounding areas was DEA’s opposition at the VCAT in 2010 to the EPA approved development of a new coal fuelled power plant to be built by Dual Gas Pty Ltd. This power plant would have been situated 1 km from the Morwell township boundary, and DEA was greatly concerned for the health of local residents from an additional local air pollution source and the health implications globally from commissioning a new coal fuelled power plant when renewable alternatives are available…..
– The burning of coal emits hazardous air pollutants, including particulate matter, sulphur dioxide, nitrogen oxides, carbon dioxide, mercury and arsenic. In recent years, Australia has seen exponential growth in interest and development of exploration and drilling for unconventional gas reserves from coal seams, shale deposits and tight sands. These reserves require special techniques such as fracking, in-seam and horizontal drilling. DEA is concerned that the rush to exploit this resource has outpaced regulation to protect public health and to adequately assess the health impacts, including exposures to industrial chemicals. This document addresses the future impacts of expansion of the nuclear fuel cycle industry on the South Australian environment and community (which are points (b) and (c) of the Terms of Reference). We present our health concerns essentially by quoting published sources relating to health from within the energy industry itself. 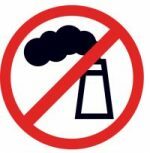 We also provide an addendum listing some non-health-related issues that suggest nuclear energy is excessively costly and unsustainable. DEA’s report No Time for Games: Children’s Health and Climate Change shines the national spotlight on the potential health harms that children especially face from global warming, and calls for swift and decisive action to reduce greenhouse gas emissions. Our membership base, together with our Scientific Advisory Committee, includes many prominent and highly respected Australians who actively support our activities. DEA is completely independent from all political parties and corporations, allowing it to maintain integrity and its ability to educate on scientific sound principles at all times. Section 5.3 of the Australian Medical Council entitled ‘A Code of Conduct for Doctors in Australia, 2009’ states “Good medical practice involves using your expertise and influence to protect and advance the health and wellbeing of individuals, patients, communities and populations.” DEA follows this code by protecting human health through a wide range of educational and other activities aimed at preserving, restoring and preventing further degradation of natural environments. We recognise the importance of the fin-fish aquaculture industry to the state of Tasmania however if the industry is to continue to grow it must ensure that the health of Tasmania’s waterways and human health are not compromised. Stationary energy, as a sector, is the single largest contributor to greenhouse gas emissions globally and in Australia. Contamination of the air we breathe is a special case of environmental exposure. Although the individual risk from air pollution is very low, exposure is ubiquitous and across the entire population so the low individual risk multiplies to a large public health problem. The scientific understanding of these risks has developed greatly in the last ten years. Exposures that were previously thought to be insignificant are now recognised as damaging to health and the range of disease outcomes attributed to air pollution is expanding. It is important for the government to recognise that its statements on climate change are eagerly scrutinised by a world readership which is greatly concerned by the threats to humanity imposed by climate change. DEA wishes to point out the need for a radical reduction in emissions to address the serious consequences that will otherwise arise. These consequences are barely mentioned in the Issues Paper and of particular concern to us is the failure to deal with health consequences anywhere in the document. The Environmental Impact Assessment process incorporates this Health Impact Assessment which includes all aspects of community health, including social and mental health aspects and social disruption. All these processes are intended to look at the balance of positive and negative impacts of the development upon which informed decisions can be made. DEA uses its expertise to determine whether these health obligations have been carried out. We have assessed whether the Queensland government has carried out these obligations in relation to resource developments. Submission to the Climate Change Authority on the future remission targets Australia should commit to as part of an effective and equitable global effort to achieve the objective of the UNFCCC (Article 2) or subsequent agreement to which Australia is a party. Doctors for the Environment Australia recommends that Australia commit to a reduction target on 2020 levels of at least 40% by 2025 and 95% by 2050. These targets are based on the severe consequences for human health and well being if global warming is not confined to two degrees. Since the constraint of emissions will have many health co-benefits and therefore cost savings, there will be some reduction in the costs of mitigation and adaptation. Most Australian children today benefit from better food, cleaner water, more preventive health measures (such as vaccination) and a higher standard of living than ever before. Childhood mortality is very low and many would think that Australian children have never had it so good. The Divestment FAQs was developed by Doctors for the Environment Australia ahead of the first ever Global Divestment Day on 13 to 14 February 2015. 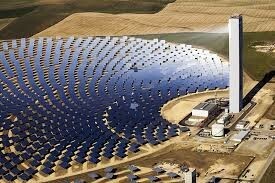 Renewable energy comes from natural sources which are constantly replenished. Members of DEA are deeply concerned by the serious threats posed to health by fracture stimulation (fracking) for unconventional (whether coal seam, shale, or tight) gas in the South East of South Australia. Natural ecosystems support our health by filtering our air, providing fresh water and food, regulating our climate, directly improving human health and protecting against the spread of disease and pests. They also foster our mental wellbeing and serve as places of recreation and sources of nature-based jobs in tourism and other vocations. Doctors for the Environment Australia reminds governments and proponents that health impact assessment is an integral part of the EIA process. In Australia, the states operate the EIA process under Health Impact Assessment (HIA) Guidelines September 2001……. What are the health concerns with Unconventional Gas? Unconventional gas (UG) refers to gas which is found in coal seams, shale or other rock formations and cannot be extracted using conventional methods. Do We Need Carbon For Transport? DEA Member Dr Bryan Furnass examines energy sources for transport across the ages, and considers a largely unexplored option: anhydrous ammonia or NH3. Read more here: Do we need carbon for transport? DEA notes that the AAQ NEPM is not enforceable by the federal government, so even if it includes standards and goals that correctly reflect current scientific thinking on the health effects of air pollution it is not a strong mechanism for ensuring that the Australian population is protected from health impacts. A unique opportunity for South Australia: Good for Health, Energy Security and Manufacturing. Doctors for the Environment Australia is focussed on the complex interaction between human health and our natural environment and is therefore interested in environmental degradation, particularly the loss of biodiversity and the effect this is having, and will continue to have, on human health and social stability. As a body of medical professionals, DEA is an interested stakeholder due to our interest and expertise on the intersection of health, environmental threats and damage to natural ecosystems such as High Conservation Value (HCV) Forests. Assoc Prof Linda Selvey speaks on Climate Change and Global Health at iDEA 2014, Doctors for the Environment Australia’s national conference. Charlie Wood, Campaigns Director for 350.org Australia and leader of the Fossil Free program, speaks about fossil fuel divestment at the Doctors for the Environment Australia iDEA conference. Dr Eugenie Kayak speaks about the work of Doctors for the Environment Australia at iDEA 2014. Dr Forbes McGain speaks on hospital sustainability – and measuring CO2 – at iDEA 2014, Doctors for the Environment Australia’s national conference. Dr Sallie Forrest speaks about becoming an environment and public health minded doctor at iDEA 2014, Doctors for the Environment Australia’s national conference. Mark Ogge, public engagement officer for The Australia Institute, speaks about Renewable Energy solutions for climate protection at the Doctors for the Environment Australia’s 2014 iDEA conference. Phil Harrington speaks on climate policy at iDEA 2014, Doctors for the Environment Australia’s national conference. Prof Rob Moodie speaks on health advocacy at iDEA 2014, Doctors for the Environment Australia’s national conference. Professor David Griggs, Director, Monash Sustainability Institute speaks to Doctors for the Environment Australia’s iDEA conference on Saturday 22nd March, 2014. Former Australian of the Year Professor Fiona Stanley speaks about the impacts of climate change on children at iDEA 2014, Doctors for the Environment Australia’s national conference. The opening address of iDEA 2014, Doctors for the Environment Australia’s 2014 conference. Address by Professor Kingsley Faulkner, Chair of DEA, and Kate Lardner, iDEA 2014 convenor. Professor Ross Garnaut speaks at iDEA 2014 on whether Australia can do it’s fair share on climate change mitigation through Direct Action. iDEA is Doctors for the Environment Australia’s national, medical student-led conference. Doctors for the Environment Australia state student groups give their reports to iDEA 2014, DEA’s national conference. Dr Helen Redmond, Rehabilitation Physician and Conjoint Lecturer, School of Public Health and Community Medicine, UNSW speaks at the Doctors for the Environment Australia iDEA conference on health risks of unconventional gas. DEA notes the limited terms of reference for this inquiry into hydraulic fracturing. This inquiry could be used as a basis for a more general inquiry into NT energy policy, including the range of options for our own energy supply, and for export to other countries. Hydraulic fracturing enables extraction of hydrocarbon deposits which are one source of energy and economic development. NT has vast reserves of renewable energy sources, in particular solar and wind, which can be used for energy and economic development. The limitation of this inquiry to details about hydraulic fracturing obstructs our capacity to consider all options both now and into the future. Almost a quarter of the disease burden and deaths in the world can be attributed to environmental factors. We cannot begin to alleviate this burden of ill-health unless we address the environmental pathways and antecedent causes. We must act urgently to safeguard our well-being and our children’s future. The result of the election in Western Australia is critically important. DEA urges WA to vote for strong climate action on April 5th 2014. The Environmental Impact Statement (EIS) response to the Terms of Reference (TOR) is inadequate and requires revision. It is important to be mindful of the fact that our health, physical and mental, is dependent on our environment. There are many and various pathways by which environmental change can and does impact human health in both the short and long term. This includes how we design our built environment, generate energy, organise health services and transport infrastructure; there is also a strong interrelationship between all of these systems. In particular, urban transport infrastructure and consequently the modes of transport we use, have a range of both direct and indirect health impacts. Planning Australia’s future energy landscape well in advance provides important opportunities to address challenges facing us and maximize energy efficiency, and security, as well as health and environmental co-benefits. However, we find the Energy White Paper (EWP) significantly flawed due to omissions or failure to consider a number of important factors. Why are there serious concerns over the development of unconventional gas (coal seam, shale, and tight gas) in South Australia? The Great Barrier Reef is of “natural significance which is so exceptional as to transcend national boundaries and is of common importance for present and future generations of all humanity” (United Nations Education, Scientific and Cultural Organization, UNESCO). The Carmichael Coal Mine and Rail Project is one of the largest proposed coal mines in Queensland, with a predicted yield of 60 million tonnes per annum from a mine site 160km northwest of Clermont plus a 189-kilometre railway line. Although mining is not a new industry to Tasmania, this proposal, which is expected to produce over 8 million tonnes of coal to be burnt at a later stage, would mark Tasmania as yet another contributor to climate change through increasing utilization of fossil fuels. DEA has a number of concerns that this proposal, if allowed to proceed, would be to the detriment of human health in Tasmania and of global public health. Impacts of the current proposal do not stop at the perimeter fence. The loading of an extra 70 million tonnes per annum of coal is covered by this planning assessment process, but that 70 Mtpa has to be brought to port in 9,855 trains per year making 19,710 trips through each suburb along the coal corridor. This extra transport task has significant health and environmental effects. It is vital that new regulations such as this proposed amendment are sufficient to protect public health. However, although it is a step in the right direction, it does not adequately protect other areas at risk – our prime farming land, our water catchments, and unique natural environments like the Pilliga forest (with its state significant biodiversity). Under the changes, these natural resources remain vulnerable to the impacts of coal seam gas mining. Moreover, the amendment does not apply to existing CSG developments, with only areas exposed to new exploration and production development being assured of exclusion. It is important to firstly emphasise that hydraulic fracturing is just one process of a group of recent innovations and new technologies that have enabled the development of previously inaccessible petrochemical reserves. The other integral innovations and technologies include “slickwater”, high volumes of fluid, horizontally or directional drilling and multi-well pads and cluster drilling. In the opinion of DEA, the proposed SEPP inappropriately promotes and facilitates the development of resource mining at the expense of the other valuable land uses, ecosystems, local communities, our health and the stability of our climate. We have a planet to manage, not just a local economy. This F&A sheet discusses the synthetic chemical bisphenol A (BPA) and its health implications as an endocrine disruptor. The sheet also discusses the current legal regulations surrounding the use of BPA in products such as drink and food containers. DEA applauds the Department of Sustainability, Environment, Water, Population and Communities for producing guidelines to clarify the implementation of the ‘water trigger’ in association with those industries that have an enormous potential impact on Australia’s water supply and quality. This is a poem from the iDEA13 Conference (April 2013) by A/Professor Grant Blashki, Nossal Institute for Global Health. This is a presentation from the iDEA13 Conference (April 2013) by Frank Nicklason, Staff Specialist Physician, Royal Hobart Hospital. This is a presentation from the iDEA13 Conference (April 2013) by Professor David Karoly, School of Earth Sciences, University of Melbourne, ARC Centre of Excellence for Climate System Science. This is a presentation from the iDEA13 Conference (April 2013) by Professor Michael Kidd AM, Faculty of Health Sciences, Flinders University. The submission by Doctors for the Environment Australia to the EIS in December 2011 noted that “This EIS fails to assess the human health impacts adequately”. The SEIS also fails. DEA is focussed on human-induced climate change, widely regarded as now the most serious, and growing, worldwide threat to human health and survival and to social stability. This is a presentation from the iDEA13 Conference (April 2013) by Peter Tait. 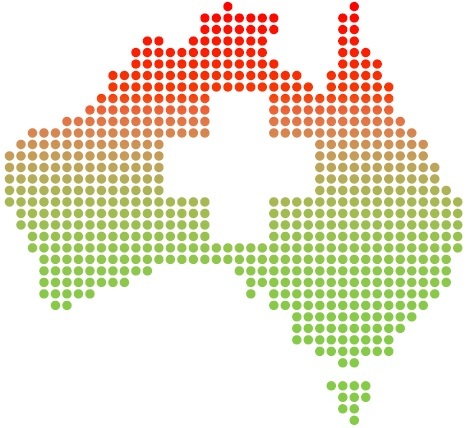 In this submission DEA outline the health imperatives to reduce Australia’s emissions as quickly as possible, and therefore put a strong case for increasing Australia’s 2020 emissions reduction target from 5% to 25%. Human pressure on the natural environment is widening and escalating. Environmental threats to human wellbeing, health and survival has become evident over the past two to three decades. Whilst Doctors for the Environment Australia addresses public health issues pertaining particularly to environmental causes of ill health, it is clear that good health exists within the wider context of sustainability and preservation of ecological support systems. On this basis we must make comment. Contrary to dominant views about the industry, coal-fired power is not the cheapest fuel and its value to the community is dubious. Yet this polluting industry continues to enjoy unjustifiable support. In this F&A sheet, we will be discussing Cash for Containers, which is a recycling campaign aimed at implementing a Container Deposits System (CDS) across all states in Australia. Learn about the process of coal seam gas (CSG) extraction, where it is being carried out in Australia and the concerns over its impacts on health and the environment. The Tarkine is an extensive area of rainforest and natural biodiversity in Tasmania. Although it has been described as “one of the world’s great archaeological regions”, The Tarkine is currently under threat form mining and forestry contractors. DEA is concerned that the Commission has not recognised the importance of protecting human health in its considerations. In our submission, we describe the need for improved regulatory outcomes and the risks associated with reforms that do not achieve this. 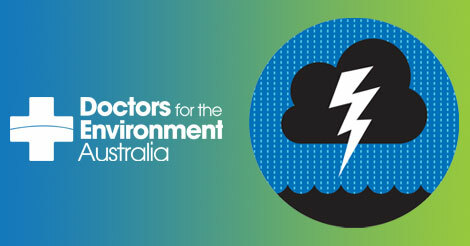 Doctors for the Environment Australia welcomes the opportunity to comment on the impacts on health of air quality in Australia, as this is an important public health issue to which inadequate attention has been paid to date. In the Draft State Public Health Plan, the focus of the climate change priority must move from its current focus on adaptation to emphasize the urgency and priority of mitigation, with clear strategies outlined for various government and business groups. This paper looks at the draft terms of reference for an environmental impact statement regarding the expansion of the existing New Acland open-cut coal mine, from 4.8 million tonnes per annum (Mtpa) to up to 7.5 Mtpa. Doctors for the Environment Australia welcomes the opportunity to highlight to the Committee that the present level of national and international action on climate change, which is contributing to the severity and frequency of extreme weather events, is so inadequate that we are accelerating towards a 4°C rise in global average temperature by the end of this century (WB, 2012). If we continue on this trajectory then we have to consider how we are to live with this rapidly changing world and the damage to vital infrastructure, and in particular the subsequent health implications. The China Stone Coal Project produces 60 million tonnes of coal per annum and will be one of the biggest mines in the world. All such mines have significant health impacts. Port Augusta has experienced pollution from its power stations for many years. The draft management plan should be acknowledged for recognising and including some of the important factors that will determine the health and sustainability of our SW forest ecosystems over coming decades. Underground coal gasification (UCG) is the process by which coal is converted to gas underground via enforced combustion. A medical school lecture delivered in September 2012 by Professor Tony McMichael, National Centre for Epidemiology and Population Health, The Australian National University, Canberra, Australia. This recent report, co-authored by the Climate and Health Alliance (CAHA) and the Climate Insitute, draws together the many ways in which we can improve health (whilst saving money) by acting to limit climate instability. DEA is part of CAHA, which is an alliance of health organisations. As such, all DEA members can feel pleased they have contributed to the publication of documents such as this. DEA is concerned about the slow progress NICNAS has made in assessing existing and unassessed chemicals on the Australian Inventory of Chemical Substances (AICS). One of the main functions of the regulatory system is to protect human health and well-being…..
Scientific evidence overwhelmingly indicates that increasing green house emissions are responsible for the climate change which is having health impacts throughout the world. This presentation was delivered to the ANU Emeritus Faculty on 21 March 2012. Please click on the links to both the powerpoint file and the accompanying text (as pdf). This article is based upon an important new report on The Psychological effects of global warming in the United States. The report will be put in the context of previous work in Australia including that by Doctors for the Environment Australia. Over 50 per cent of the earth’s forests have been cleared, mainly for grazing land expansion, agriculture and road construction. By George Crisp and David Shearman on 20 March 2012 in Renew Economy. We thank Renew Economy. Though the EWP sets out to address the legitimate aims of reducing emissions through “clean” energy, ensuring energy security and facilitating economic development, it repeatedly makes a series of assertions and assumptions that are contradictory. CSG: Undermining Our Food Bowls – Dr Helen Redmond. DEA is concerned about the environment and effects of human activity on environmental and ecological function. Our concern is grounded in the necessity of a well functioning environment for human health and wellbeing. Observations concerning the Air Quality section of Environmental Impact Statement for Acland Stage 3 (Chapter 9) by medical experts from Doctors for the Environment Australia. In SA an amendment on Regulated Trees to help development has lead to a spate of removals of mature trees by residents in Adelaide and suburbs who worry about leaves in their gutters. We note “The CEFC will act as a catalyst to private investment which is currently not available and thereby contribute to reducing carbon emissions and cleaner energy”. DEA considers the current level of assessment, monitoring and regulation of CSG exploration and mining activities in NSW to be inadequate to protect the health of current and future generations of Australians. DEA was represented at this Coal Seam Gas Community forum by Dr Helen Redmond who speaks around 0:42s. The meeting addressed concerns over gas extraction in the Sydney Basin. Coal seam gas mining (CSG) may have adverse impacts on human health by contamination of drinking and agricultural-use water, and air. Contaminants of concern include many of the chemicals used for fracking, as well as toxic substances produced through this process and mobilised from the sedimentary regions drilled. Some of these compounds can produce short-term health effects and some may contribute to systemic illness and/or cancer many years later. Dr Helen Redmond – Doctors for the Environment – who talks about the impacts of coal-seam gas water contaminants and the impacts on human health. Dr Helen Redmond – Doctors for the Environment from LockTheGate on Vimeo. Most people now know that climate change is a serious issue, and have some understanding of the effects that it will wreak. Few, however, are aware of the extraordinary impacts that climate change will have specifically on health. Fossil fuels are responsible for a significant disease burden in our community contributing to climate change. Wind power and other renewable energies have the potential to reduce threats to health through reduction in air pollution and mitigation of climate change. 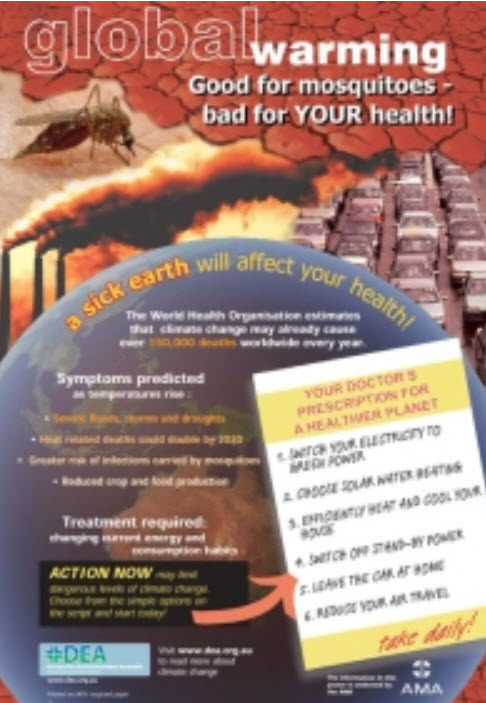 This is the Doctors for the Environment (DEA) population and health poster. It has been prepared for display in doctor’s waiting rooms right across the country. Doctors for the Environment Australia has a “green hospitals group” and is taking an increasing interest in promoting action to reduce the carbon footprint of hospitals. As many of our medical colleagues are unaware of the health impacts of climate change DEA has developed a set of slides which you can use to present to your peers. This PowerPoint presentation covers basic climate science and the health impacts of climate change and uses a medical analogy to put the case for urgent action. (The download link is on the right of screen). Associate Professor Townsend is involved, in collaboration with Parks Victoria and other partner organisations, in investigating the benefits of contact with nature for human health and wellbeing. Current and recent research includes: an investigation of health and wellbeing outcomes of differing levels of access to nature for residents of high-rise housing; a study of mental health benefits of hands-on nature based activities in primary schools; a nature based intervention program for people suffering depression, anxiety and/or social isolation; an assessment of health benefits of a visiting companion animal program in an acute care hospital; several projects exploring the health and wellbeing outcomes of ‘bush adventure therapy’ programs in Australia; several projects exploring the benefits of environmental volunteering; and a project assessing the valuing and use of parks in high and low SES areas. Dr Colin Butler – ANU. Talk given at the student conference for Doctors for the Environment, Australia. 5th December 2009. This handout was developed in South Australia for both non-DEA and DEA members. It is adapted from a number of other resources and considers the changes that individuals can make to their lifestyles to reduce their carbon footprint and lead by example. The words ‘economic growth’ appear in most news bulletins and political articles in the press. This poster raises the issue that growth in many ways is a health hazard for it is incompatible with a sustainable future for humanity. Doctors for the Environment Australia (DEA) has a deep interest in energy policy because it is the major determinant of reduction in greenhouse gas emissions which via climate change present a significant threat to human health. Not many lectures are a work of art. This one is, in more ways than one. Bryan Furnass, DEA Member, welds ecological and medical knowledge, using Western art and literature, to create a masterpiece. When you read it you will both learn and enjoy the experience. Don’t miss it! Submission to the Senate Standing Committee on Economics on the Renewable Energy Legislation Amendment (Renewable Power Percentage) Bill 2008. Doctors for the Environment Australia (DEA) has major concerns about the expected effects of climate change on human health and well being. We have recently released nationally and internationally a report on this topic. It is therefore appropriate that we submit to this Senate Committee to emphasise that a significant reduction in greenhouse gas emissions is urgent and the only way that this can be quickly accomplished is by encouraging energy saving and expanding renewable energy provision. The situation is urgent because recent scientific reports are showing that the harmful effects of climate change are arising much faster than anticipated from IPCC data. There is increasing danger that climate change may become irreversible. The World Health Day, celebrated on April 7 each year, creates awareness of a specific health theme to highlight a priority area of concern for the World Health Organisation. For 2008 the World Health Organisation has selected the topic “protecting health from climate change” This submission to the Garnaut Committee will indicate why this topic is so important and will document from the medical and scientific literature the implications for health in Australia. If these threats to health and other problems associated with climate change are to be avoided, Australia needs to take strong decisive action. The science is sufficiently clear to warrant a reduction in Australia’s greenhouse gas emissions of at least 60 per cent by 2050. DEA strongly supports the development of an emissions trading scheme and believes that it will play an important and prominent role in moving Australia’s emissions profile towards this target. A national scheme would ideally be initiated by and coordinated by the Commonwealth Government. However as such action is not forthcoming, the joint initiative by the States and Territories Governments is to be commended. The USA and Australia recognise the interdependence of nations in counteracting threats to all (eg “terror”) and call for concerted action. By contrast, USFTA fails to recognise that Australia is part of a world which for its future survival, must recognise the interdependence of all peoples and its ecological systems. DEA has a major philosophical problem with the proposal; it smacks of self- interest. It promotes possible, though unproven, short-term economic gains for the participants without consideration of the long-term consequences for future generations. It is an agreement with the intent of benefiting two wealthy countries. There is no recognition that USFTA and other trade agreements might have long-term consequences for all nations by accelerating environmental damage, so creating a future debt for all….